On July 4, 2012, the Royal Hawaiian, a Luxury Collection Resort, introduced Honu by the Sea, a new Broadway-inspired musical in the famed Monarch Room fronting Waikiki Beach. For three seasons, crowds and audiences of all ages danced and sang along as the cast and crew brought the show’s ocean characters to life. 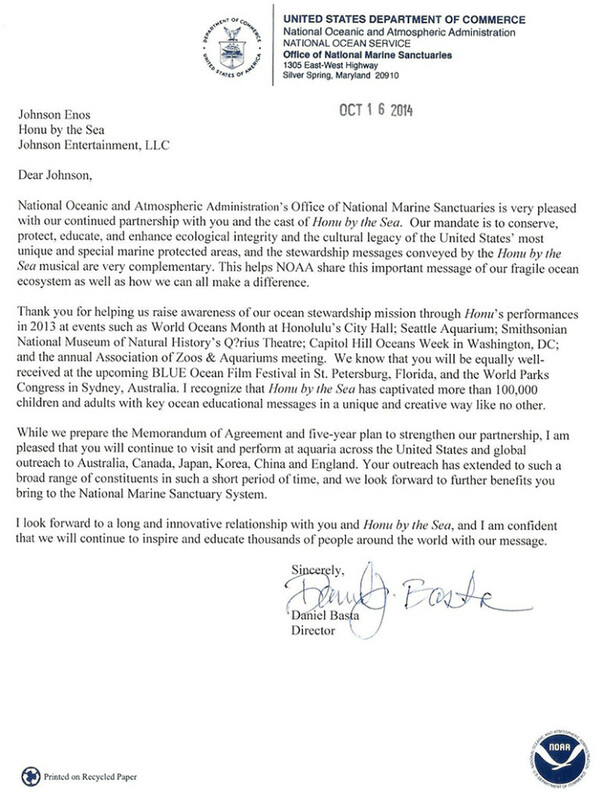 As interest in the musical grew, Honu by the Sea was invited to perform at various aquariums across the country, built relationships with other ocean conservation organizations and even appeared at the Smithsonian Institution. Honu by the Sea is excited to announce an international tour schedule for the 2015 season and will be returning to its home in Hawaii with a splash at historic Hawaii Theatre. View our entire tour schedule to find a show near you. Inspiring everyone to be guardians of the sea. Team Honu is excited to be embarking in a partnership with the National Oceanic and Atmospheric Administration (NOAA) on a world tour for the next five years to educate, empower and raise ocean awareness in a unique and creative way like no other.